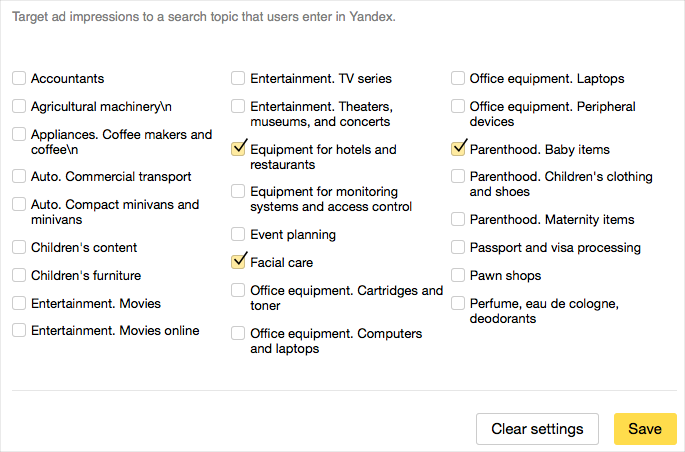 For more information about audience settings, see Yandex Advertising Technology. You can limit the frequency of impressions per user (for example, per day or per week) and ensure maximum target-audience coverage. For example, you may limit daily impressions to three per user. Number of impressions — the maximum number of banner impressions that a single user will see during the period indicated. Period — number of days over which a banner will be served to a single user. Maximum number of impressions — maximum number of banner impressions that a single user will see during the course of the banner's entire line. You can specify the characteristics of the mobile devices you want your ads to display on. You can specify the types of devices (for example, tablets or computers) that you want your ads to display on. Search retargeting is a technology that lets you display ads to users that searched for specific topics on Yandex search. You can restrict impressions to users who visited specific pages, such as certain sections of Yandex services (based on “Yandex Data”) or the advertiser's site (based on “Advertiser Data”). To set up behavior targeting, your audience coverage during the 28-day period preceding your presumed ad-launch date should consist of at least 20,000 users. The total number of unique users based on all display conditions for the last 28 days. If a user satisfies two or more targeting criteria, they will still only be counted once. 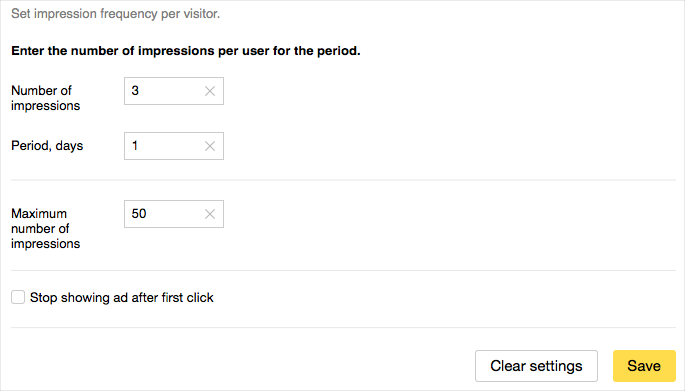 You can enter a criteria for stopping impressions. If a user satisfies at least one criteria for stopping impressions, they will not see banners until they satisfy one of the targeting criteria. Advertiser data can include Yandex.Metrica goals. Install a Metrica counter on the advertiser's webpages. Your advertiser should be the owner of the counter or have access to it. 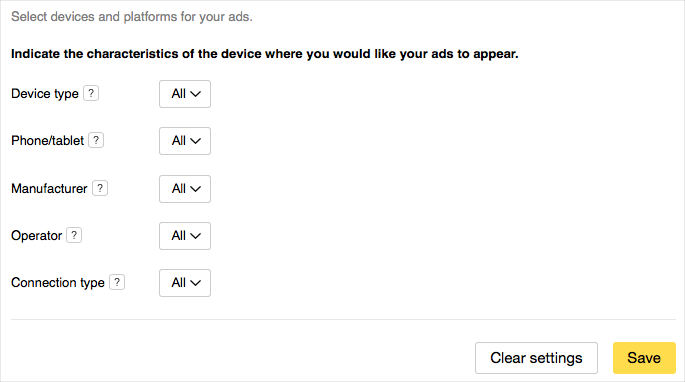 In the targeting criteria, select Advertiser data. Select the counter number as the value. Mark the goals that you want to use as targeting criteria in the table. Make sure that the selected goals cover at least 20,000 users. 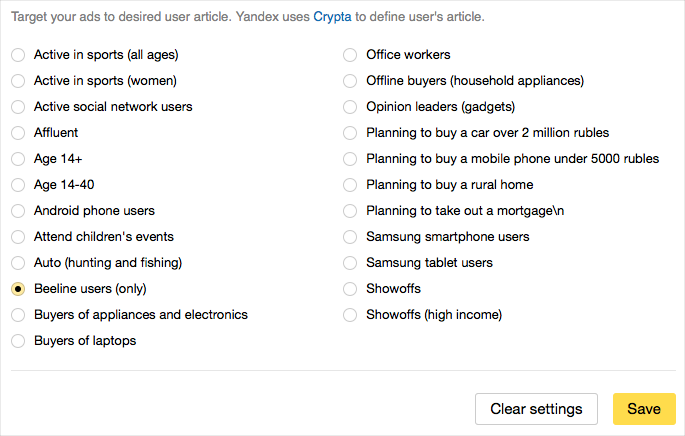 Yandex analyzes the online behavior of its users and puts them into target group based on their interests. 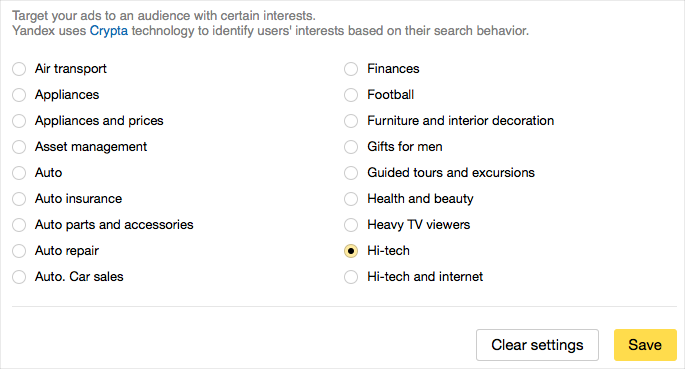 Targeting based on interests means that ads are only shown to users from the target group that you select. Targeting based on categories means that ads are only shown to users from the target category that you select.